Selecting the best cardiopulmonary resuscitation (CPR) and first aid training service provider in Victoria can be a hard task. A lot of people are concerned if they will be given the right kind of certification that suits the needs of a school or workplace. Victoria First Aid stands out as the top provider of certification programs in British Columbia. A number of Canadian CPR courses in Victoria are available including level’s “A”, “B”, “C” and “HCP”. These courses are either combined with first aid training or can be taken in a stand-alone format (CPR level “B” must be combined with childcare first aid). Participants that successfully complete these one or two-day courses will receive a St Mark James certificate that is valid for 3 years and a book to take home. Students can easily sign up for course through the Victoria First Aid website or you can scroll to the bottom of the page to enrol in Canadian CPR courses in Victoria via the on-line registration form. You can visit the Victoria First Aid website linked below. The site has a complete list of available classes and a registration form. Students are also encouraged to enrol via e-mail, telephone call, or walk-in during business hours in any of the training centres in Victoria. What does Victoria Aid offer? Victoria First Aid offers the cheapest rates for all programs in Victoria, British Columbia. Rates are paid once – during enrolment – and include taxes, certification fees, and training manuals. Full refunds are given if you drop out, as long as a 72-hour notice is done beforehand. Other training service providers can’t compete with the large selection of programs available at Victoria First Aid. CPR training programs have three levels inclusive of first aid and AED training. AEDs are machines that apply shock to restart the heart of a victim of cardiac arrest. 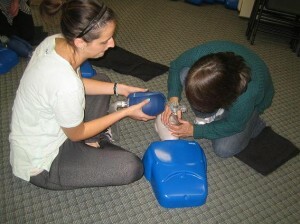 Stand-alone classes for CPR, first aid, and food safety as available. Private courses are usually taken by big groups of trainees and companies but you can inquire about booking them with the information above. Certificates from St Mark James are awarded to trainees after completion of course. The certificates are valid for three years and are renewable (re-certification) through refresher programs held twice a week at Victoria First Aid. Classes are held in high-end training centres with spacious classrooms and the latest training equipment in first aid and CPR. There are three types of blood-borne diseases that rescuers should be particularly aware of. The human-immunodeficiency virus (HIV) is responsible for the acquired immune deficiency syndrome (AIDs) which affects the body’s immune system or its ability to fight disease and infection. Currently no vaccine exists to protect people from this virus and the best defence remains adequate protection to help prevent infection. Hepatitis B is a viral disease of the liver that can cause severe liver damage or liver cancer. Fortunately a vaccine does exist that can prevent Hepatitis B from occurring. The vaccine is usually made available to high risk individuals. Hepatitis C causes much of the same liver damage as Hepatitis B but no vaccine is currently available to prevent this disease. For more information about using barrier devices and preventing disease transmission, enrol in St Mark James first aid training program with Victoria First Aid. On-line Enrolment Form for Canadian CPR Courses in Victoria, B.C.